Plasma α-tocopherol (vit E) and blood selenium (Se) concentrations in February were determined in samples from 314 dairy cows in Norway, selected to provide a representative subset of the Norwegian dairy cow population. Each sample was followed by a questionnaire with information about feeding of the cow at the time of sampling. The results were correlated to herd data and to calving and health data for each cow from the Norwegian Dairy Herd Recording System and the Norwegian Cattle Health Recording System. The mean concentrations were 6.9 μg vit E per ml plasma and 0.16 μg Se per g blood. Both levels were highest in mid lactation. Plasma vit E varied with the amount of silage fed to the cow, while blood Se varied with the amount of concentrates and mineral supplements, and with geographical region. No differences in vit E or Se levels were found between cows with recorded treatments for mastitis, parturient paresis or reproductive disorders in the lactation during or immediately prior to sampling, and those without such treatments. For ketosis, a small difference in blood Se was found between the groups with or without recorded treatments. It is concluded that winter-fed lactating cows in Norway had an adequate plasma level of vit E and a marginal-to-adequate level of Se. Konsentrasjoner av α-tokoferol i plasma og selen iblod ble bestemt i prøver fra 314 mjølkekyr i Norge ifebruar. Kyrne var trukket ut som et representativt utvalgav norske mjølkekyr, og et spørreskjema medopplysninger om kua og fôringen på prøvetidspunktetfulgte hver prøve. Ved kobling mot databasene tilden norske Kukontrollen og Helsekortordningen bleresultatene sammenholdt med individuelle helsedatafor kyrne og med relevante data for besetningenederes. Gjennomsnittskonsentrasjonene i hele materialetvar 6,9 μg α-tokoferol /ml plasma og 0,16 μg Se/g blod. Begge parametre varierte med dager fra kalving,og var høyest midt i laktasjonen. For øvrig variertevit E-nivået med mengden surfôr kua fikk vedprøvetidspunktet, mens Se-nivået varierte medmengdene av kraftfôr og mineralstilskudd, samt medgeografisk område. Det var ingen signifikant forskjellverken i vit E eller Se-nivå mellom kyr som ble behandletfor jurbetennelse, mjølkefeber eller reproduksjonssjukdommeri den aktuelle laktasjonen ogkyr uten slike behandlinger, men kyr som var behandletfor ketose hadde litt lavere Se-nivå enn kyruten ketosebehandlinger. Som helhet viste undersøkelsenat norske vinterfôrete kyr i laktasjon haddeet tilfredsstillende plasmanivå av vit E, og et Se-nivåi blod varierende fra tilfredsstillende til marginalt. The general significance of adequate vitamin E (vit E) and selenium (Se) levels in bovine nutrition is well documented . The practical importance of vit E and Se status for mastitis resistance and reproductive function in cows is more controversial . Several authors have reported a beneficial effect of vit E and/or Se on mastitis frequency [35, 6, 23], while others have failed to confirm such effects [31, 26, 4]. Vit E and Se deficiency problems are well known in Norway . There are appreciable regional differences in Se status within the country, most clearly demonstrated in sheep . Vit E and Se have been added to commercial concentrates for many years . In spite of this, a previous study of 64 Norwegian dairy herds showed a substantial fraction at marginal Se levels . Except for a recent study in 14 organic dairy farms , systematic investigations of plasma vit E levels in dairy cattle have not been previously published in Norway. The Norwegian Cattle Health Recording System has been in operation since 1975 [37, 48]. At the time of this study, about 90% of all dairy cows in Norway were enrolled in the system. Through co-ordination with the Norwegian Dairy Herd Recording System, the Health Recording System permits evaluation of the health effects of different management, production and feeding factors in the Norwegian dairy industry. The aim of the present investigation was threefold: Firstly, to assess the vit E and Se status of the Norwegian dairy cow population in winter; secondly, to investigate possible regional differences and factors of production and feeding that influence the vit E and Se status of individual cows; and thirdly, to evaluate possible statistical associations between vit E and Se status and recorded disease incidents in the sampled cows in the lactation period during or immediately prior to sampling. The blood samples were collected in the winter of 1992. The minimum number of required samples was calculated to be about 350, based on a desired accuracy of ±0.5 μg/ml for the estimate of mean plasma vit E in the population, and an estimate of the expected standard deviation. Therefore, 360 dairy herds were selected for sampling. The number of herds to be selected from each of Norway's 18 rural counties was set proportionally to the total number of registered dairy cows in that county in 1991. Within each county, the herds to be sampled were selected by stratified random sampling of municipalities and herds within the municipalities. Only herds participating in the Norwegian Cattle Health Recording System were included. After the selection of the herds, one veterinary practitioner in each of the relevant municipalities was contacted and asked to draw a blood sample from one cow picked at random in each of the chosen herds. If one of the chosen herds could not be sampled, the veterinarians were asked to select another herd in the same municipality. They were instructed to select among all cows (i.e. female cattle with at least one calving), including those that were dried off. They were asked to draw the samples within the two-week period from the 3rd to the 16th of February 1992. In addition, the veterinarians were asked to fill in a questionnaire with information about the sampled cow and her feeding at the time of sampling. Blood samples from 314 cows were obtained. The samples were drawn in heparinized Vacutainer® tubes and immediately sent to the National Veterinary Institute. Each sample was followed by a completed questionnaire. The herds from which samples were not obtained were evenly spread throughout the different counties, so the representativity of the collected samples was not substantially changed. In addition to the main study, a satellite study of the change in plasma vit E concentrations through the winter was done at two dairy farms. One of the farms (farm A) is located in the south-western coastal area, the other (farm B) in the south-eastern inland. Both farms used regular and baled silage as their main roughage . Blood samples were collected from 6 cows at farm A and 9 cows at farm B in early November, in early February and in the last part of May. One sample of the silage fed to the cows was collected with each blood sampling, except on farm B in November. Blood Se concentration was determined by atomic absorption spectrometry with a hydride generator system , using a Varian SpectrAA-600 with a VGA-76 vapour generation accessory. Before analysis, each sample was prepared by oxidative digestion in a mixed solution with concentrated nitric and perchloric acids, using a Tecator Digesting System heating unit. A quality control system was adopted, using analysis of one sample of a certified reference material (NBS Bovine liver 1577 A) and one sample of an internally established reference material from porcine blood for each series of 35 analytical samples. All results of the quality control analyses were within preset limits compared to the reference values. The vit E concentrations were analysed in plasma from the same samples. After blood for the Se analysis was taken out, the remaining sample was centrifuged and plasma was either analysed the same day or kept frozen at -70° until vit E analysis could be carried out. In 10 of the plasma samples, a red discolouration was observed, indicating some degree of hemolysis during transport. These samples were randomly spread in the material. A few samples were too small to perform both analyses. In those cases, priority was given to the vit E analysis. Therefore, the plasma vit E concentration was measured in all 314 samples, while blood Se concentration was measured in 301 samples. After precipitation of proteins with ethanol (+1% ascorbic acid), tocopherols in the plasma samples were extracted with hexane. After mixing, centrifugation and separation of the supernatant, the hexane was evaporated under nitrogen flow, and the residue redissolved in ethanol. Vit E concentrations were measured by HPLC, using Perkin-Elmer equipment with a reversed-phase C18 column, methanol-water (95/5) mobile phase, and a fluorescence detector with excitation wavelength 296 nm and emission wavelength 330 nm. Calculations were based on the use of tocol as an internal standard in all samples. For control, every fifth sample was re-analysed with an added α-tocopherol standard. Blood samples from the satellite study were analysed for plasma vit E concentrations only. The silage samples from the satellite study were cut, mixed, weighed without drying, and analysed with a modified version of a method described by . After addition of pyrogallol, careful saponification with KOH at 75°C and extraction with hexane, the analysis procedure was parallel to the one described for the plasma samples. Dry weight of the silage samples was determined separately, and the vit E content calculated in μg/g dry matter. Veterinarians provided the following information on the questionnaires: registry numbers of the herd and the cow, the date of sampling, noted day of calving, daily milk yield of the cow (in kg) at the time of sampling, daily amount (in kg) of concentrates, daily amount (in kg) and quality (on a scale from 1 to 4) of regular silage, baled silage, hay, straw and other feed, and daily amount (in g) and kind and brand of mineral supplements given to the cow at the time of sampling (Table 1). Both concentrates and mineral supplements used for dairy cattle in Norway contain sodium selenite (see discussion). ** Encompasses all recorded mastitis treatments, included treatments for acute clinical mastitis, subacute/chronic and subclinical mastitis. The Norwegian Dairy Herd Recording System and the Norwegian Cattle Health Recording System are based on registration of all cows in a nationwide database. Reproduction and milking data for each cow are registered continually, as well as data on production and feeding at herd level. Disease records are available from a health card following each cow from birth till slaughter [37, 40, 48]. In the present study, 285 of the 314 sampled cows could be identified in the recording systems, with a complete data record. For assessment of regional differences, the country was divided into five regions (Fig. 1). The regions were formed according to previous information on Se levels in soils , pasture and feed plants [12, 49]. All the sampled cows were included in this analysis. Differences between regions were evaluated with Student's t-test. Map of regions used in the analysis of regional differences in plasma α-tocopherol and blood selenium: Region 1: South-eastern Norway (Østfold, Akershus, Oslo, Hedmark, Oppland, Buskerud, Vestfold, Telemark, Aust-Agder and Vest-Agder counties). Region 2: Rogaland county. 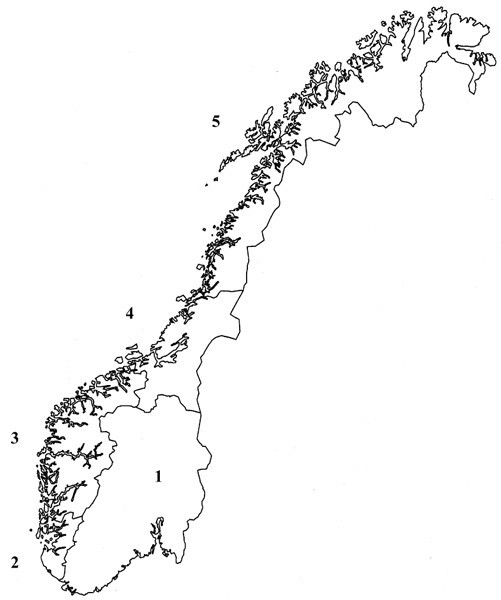 Region 3: Western Norway (Hordaland, Sogn og Fjordane and Møre og Romsdal counties). Region 4: Middle Norway (Sør-Trøndelag and Nord-Trøndelag counties). Region 5: Northern Norway (Nordland, Troms and Finnmark counties). In the remaining statistical analysis, data from the questionnaires were combined with data from the Norwegian Dairy Herd Recording System and the Norwegian Cattle Health Recording System. The variable describing the number of days postpartum (DAYSPP) was calculated from the day of calving registered in the recording systems. Daily milk yield and the feeding variables for the individual cows were taken from the questionnaires, while the cow health information was taken from the Cattle Health Recording System. The variables used in the main statistical evaluations are listed in Table 1. The analysis included 285 cows for vit E and 274 cows for Se. Pearson correlation analysis was used to identify individual production and feeding parameters associated with plasma vit E and blood Se concentrations. After identification of significantly associated parameters, the relative contributions of the different parameters to the vit E and Se variations were estimated with SAS® General Linear Models (GLM) procedures: MODEL analysis type III . To evaluate possible associations of vit E and Se levels to the health of the sampled cows, the analysis was restricted to five recorded health incidents that are sufficiently frequent to warrant a statistical evaluation at the individual level (any mastitis, acute mastitis, parturient paresis, ketosis, and reproductive disorders; see Table 1). For each of these diseases, vit E and Se levels in the group of cows with recorded treatments in the same lactation were compared with those without recorded treatments, using Student's t-test (Table 3). a,b,c: Mean values without common letters are significantly different (p < 0.05). m,n: Mean values without common letters are significantly different (p < 0.001). 1 Due to limited material, some samples were analysed for a-tocopherol only. See Materials and methods. *These two values are significantly different (p < 0.02). Separately, a GLM analysis was done on the association of relevant management, production, feeding and health variables at herd level to the variation of vit E and Se levels in the sampled cows. This analysis included 304 herds for vit E and 293 herds for Se. The Norwegian Dairy Herd Recording System was also checked for remarks on oxidized and other unwanted milk flavours in the herds of the sampled cows around the time of sampling. Data were analysed using SAS® statistical software and MS Excel 2000. The mean plasma vit E concentration in the sampled cows was 6.9 μg/ml, with a standard deviation of 3.0 μg/ml and a range from 1.0 to 19.0 μg/ml. The mean blood Se concentration was 0.16 μg/g, with a standard deviation of 0.05 μg/g and a range from 0.05 to 0.27 μg/g (Fig. 2). In the satellite study, the mean plasma vit E concentrations in November, February and May at farm A were 5.2 (1.3), 6.5 (1.7) and 5.5 (2.0) μg/ml (standard deviations in brackets). The corresponding values at farm B were 5.7 (2.1), 7.6 (1.7) and 5.2 (1.3) μg/ml. Relation of plasma a-tocopherol (μg/ml) and blood selenium (μg/g) to days from last calving (DAYSPP) in Norwegian dairy cows in February. The least sum of squares lines (GLM model type III, with linear, quadratic and cubic terms of DAYSPP) with 95% confidence limits are indicated. n = 285 for α-tocopherol; 274 for selenium. The vit E concentrations found in the silage samples from farm A were 21 μg/g dry matter in November, 36 μg/g in February and 65 μg/g in May. The corresponding values from farm B were 39 μg/g in February and 74 μg/g in May. From the information provided in the questionnaires, the following averages of different feed-stuffs fed to the sampled cows per day (range in brackets) were calculated: regular silage 35.8 kg (0–60 kg), baled silage 3.0 kg (0–60 kg), hay 0.7 kg (0–10 kg), ammoniated straw 0.4 kg (0–10 kg), concentrates 6.5 kg (0–14 kg), and mineral supplements 17 g (0–180 g). The average daily milk yield of the cows at sampling was 21.9 kg (0–40 kg). There was a weak but significant correlation between plasma vit E and blood Se concentrations in the sampled cows (R = 0.13, p < 0.05; n = 301). Mean plasma vit E and blood Se concentrations in the five regions (Fig. 1) are shown in Table 2. Region 1 (south-eastern Norway) and region 2 (Rogaland county) had significantly lower blood Se concentrations than the three other regions. The differences were less distinct for vit E concentrations, but region 5 (northern Norway) had significantly lower vit E levels than regions 2 and 3 (Rogaland county and western Norway). Region 1 (south-eastern Norway) also had significantly lower vit E levels than region 3. Though the variation was very large, there was a distinct relation between both vit E and Se levels and number of days from calving to the sampling day (DAYSPP). The GLM analysis indicated a convex curve for both nutrients, with the highest levels in the cows in mid lactation (Fig. 2). DAYSPP, DAYSPP*DAYSPP, TOTSIL, DAYSPP*DAYSPP*CALVNUMB, DAYSPP*CALVNUMB and CALVNUMB. The results for the three last parameters indicated that the observed relation between plasma vit E and DAYSPP was strongest in multiparous cows. This model gave an R2 of 0.23, indicating that it explained 23% of the plasma vit E variation in the sampled cows. The individual production and feeding parameters indicated by the initial analysis to be positively associated with blood Se were daily amount of concentrates (CONC) and mineral supplements (MIN) fed at the time of sampling. The amount of ammoniated straw (STRAW) was negatively associated. The parameters that contributed significantly to the variation in blood selenium in the final GLM model type III analysis were, in decreasing order of importance: DAYSPP, DAYSPP*DAYSPP, CONC, MIN and STRAW. This model gave an R2 of 0.25. The herd production and feeding parameters that contribued significantly to the variation in plasma vit E in a GLM model type III analysis were, in decreasing order of importance: size of the herd, percentage of silage in the feeding of the herd that year, the corresponding percentage of concentrates, and the average milk yield per cow. This model gave an R2of 0.10. The significantly contributing herd factors for blood Se were percentage of concentrates in the feeding of the herd, the corresponding percentage of silage, and the average milk yield, in that order (R2 = 0.18). Mean plasma vit E and blood Se concentrations in samples from cows with or without recorded treatments for the five selected diseases in the relevant lactation are listed in Table 3. No significant difference in vit E or Se levels was found between the two groups for any mastitis, acute mastitis, parturient paresis or reproductive disorders. A small but significant difference in blood Se was found between those with recorded treatments for ketosis and those without. In the analysis of herd health data, a negative statistical association was observed between the vit E levels in the sampled cows and the total number of treatments for parturient paresis in their herds. On this basis, the influence of plasma vit E and blood Se on the number of treatments for parturient paresis of the sampled cows was tested by GLM model analysis. With the exception of a small negative effect of vit E in 3rd lactation cows only, statistically significant effects could not be confirmed at the individual level. Concerning effects on unwanted milk flavour, the Norwegian Dairy Herd Recording System had remarks for only 23 of the herds in the three first months of 1992, and only 11 in the month of February. The mean levels of vit E and Se in the sampled cows from the herds with remarks were not significantly different from the herds without such remarks. In only 5 of the 23 herds with remarks on milk flavour was the unwanted flavour classified as strong, in 2 herds it was classified as an oxidized flavour, and in 3 herds as a feed-related flavour. Because of the low percentage of sampled herds with relevant remarks on milk flavour, the results were considered inconclusive. The plasma vit E concentrations in the February samples from farm A were significantly higher than the concentrations in the November samples (p < 0.05, paired t-test), but not significantly different from the May samples. From farm B, the plasma vit E concentrations in the February samples were significantly higher than in both the November samples (p < 0.01) and the May samples (p < 0.05). Because of the weighted and randomised selection of cows to be sampled, the mean plasma vit E and blood Se concentrations found in this study can be used as estimates of the true mean concentrations in the Norwegian dairy cow population, in February 1992. The 95% confidence intervals of these estimates were calculated to 6.9 ± 0.3 μg/ml for plasma vit E and 0.16 ± 0.01 μg/g for blood Se. The slight hemolysis observed in 10 of the samples may have influenced the plasma vit E concentrations measured in these samples. However, due to the small number of samples affected, the effect on the overall results was considered to be negligible. Recommended and diagnostic limits of plasma vit E in dairy cows are stated in different ways by different authors. use 4.0 μg/ml as the dividing line between an adequate and inadequate level,  recommends 3–3.5 μg/ml as a minimum in peripartum cows, while  consider levels above 2.0 μg/ml as adequate in adult cattle. suggest 2.0 μg/ml as a critical level below which deficiency may occur, while  consider concentrations below 1.0–1.5 μg/ml as suboptimal and potentially hazardous. In the present study, 84% of the sampled cows had plasma vit E concentrations at or above 4.0 μg/ml, and only 1% had values below 2.0 μg/ml. These results indicate a very satisfactory vit E status in winter-fed Norwegian dairy cows in 1992. The average plasma vit E level observed in our study was 1–2 μg/ml higher than the levels reported by  in healthy lactating winter-fed cows in Sweden, and more than three times above the average found by  in dairy cows in Ohio in winter. Similarly, there is no general agreement in the literature on limits of adequate and deficient levels of blood Se concentrations. and  set the limit of adequacy for blood Se at 0.20 μg/ml, while  and  declare concentrations above 0.10 μg/ml as adequate. This discrepancy is partly based on different estimates of the relation between blood Se and plasma Se, as all these authors agree that plasma Se levels above 0.07–0.075 μg/ml are adequate. In Norwegian cattle,  found that a plasma Se concentration of 0.07 μg/ml corresponded on average to a blood Se concentration of 0.13 μg/ml. In the present study, analysis of blood Se was preferred, because blood Se is considered to be the most reliable expression for long-term selenium supply . Twenty-one per cent of the sampled cows had blood Se concentrations at or above 0.20 μg/g1, 38% had concentrations from 0.15 to 0.19 μg/g, 29% from 0.10 to 0.14 μg/g, and 12% had less than 0.10 μg/g. The results indicate marginal Se status in a higher proportion of Norwegian dairy cows than that observed for vit E. This is not surprising, as farmland and crops are low in Se in most of Norway [46, 49]. However, the mean value in this study was 0.05 μg/g above the average reported by  in 147 lactating cows from 17 normal herds in Norway in April 1985. The observed regional differences in plasma vit E concentrations (Table 2) may partially be explained by differences in feeding practices. In region 1 (south-eastern Norway), summers are somewhat less rainy than in the rest of the country, so the use of hay has been more common. Data from the questionnaires showed that the cows in region 1 were fed significantly more hay than in any other region and significantly less silage than in regions 3–5 at the time of sampling. Vit E is better conserved in silage than in hay , and higher plasma vit E levels in silage-fed than in hay-fed herds have been previously reported from Sweden by . On the other hand, we found no differences in feeding practices between region 5 (northern Norway) and regions 2–4 that can explain the lower vit E levels in region 5. These low levels may be related to the short summers and poorer climatic conditions in region 5. The distinct regional differences in blood Se are not apparently related to feeding practices. The average amount and kind of concentrates fed to the cows were quite similar in all regions, and the average amount of mineral supplements was slightly higher in region 1 than in regions 3 and 4. On the other hand, the observed pattern is in fairly good accordance with the geographical distribution of Se in farmland soil, harvested roughage and sheep tissues [46, 49, 34]. This regional effect may also explain the difference between the mean blood Se value in the present study and the one reported by . All their samples from normal lactating cows were collected in south-eastern Norway, and their results are not far from the levels recorded in region 1 in this study. The two individual feeding and production parameters that contributed most to the variation in plasma vit E in the GLM analysis were time from last calving (DAYSPP) and daily amount of any silage (TOTSIL) fed to the cow at the time of sampling. As mentioned, the relationship between DAYSPP and plasma vit E followed a convex curve. The variation was large, but the correlation was statistically significant and readily visible (Fig. 2). A positive association between plasma vit E and days postpartum has been reported by several authors [43, 26, 4, 25]. Low plasma vit E levels around calving may be influenced by redistribution of vit E to colostrum or other physiological factors , but the rise in vit E after calving may also be related to a higher intake of feed with a good vit E content in the postpartum period. In the present study, the importance of the feed factor is supported by the significant contribution from the TOTSIL parameter to the vit E variation. The results of this study support the conclusion that silage is a good source of vit E in winter-fed cows in Scandinavia, and are thus in good accordance with the findings of . This conclusion is also supported by the results of a recent study in organic sheep and dairy cattle farms in Norway . Traditionally, the regular ensilation method in Norway is in tower silos, with formic acid and salts of formic acid as the most common additives . More than 90% of the silage fed to the sampled cows in this study was of the traditional kind. Miller et al. reported in 1995 that serum vit E levels in Ohio dairy cows were significantly lower in winter (December–February) than in other seasons. The authors explained this by an extensive loss of vit E in stored forages . The expectation of a similar effect lay behind the decision to collect the samples for this study in February. The high plasma vit E levels found indicate a less prominent seasonal effect in Norwegian dairy cows, at least in the winter of 1992. This conclusion is supported by the results of the satellite study. In both of that study's farms, the average plasma vit E levels were higher in February than in November and in May, and the vit E concentrations in the accompanying forage samples were actually highest in May. This seeming inversion of the expected pattern may be a fortuitous result of variation in the silage quality fed at different times on these two farms. Still, it does indicate a quite good preservation of vit E in stored silage in Norway. Silage does also contain more polyunsaturated fatty acids (PUFA) than hay. This may increase the biological demand for vit E in the feed, and thus modify the beneficial effects of silage . The sampling and analytical work of the present study was done in 1992–93. In the subsequent years, the use of big bale silage has increased in Norway, compared with traditional ensilation methods . The stability of vit E may be lower in baled silage than in traditional silage . At present it is not known if this may have had a negative influence on the vit E status of Norwegian cattle in winter. 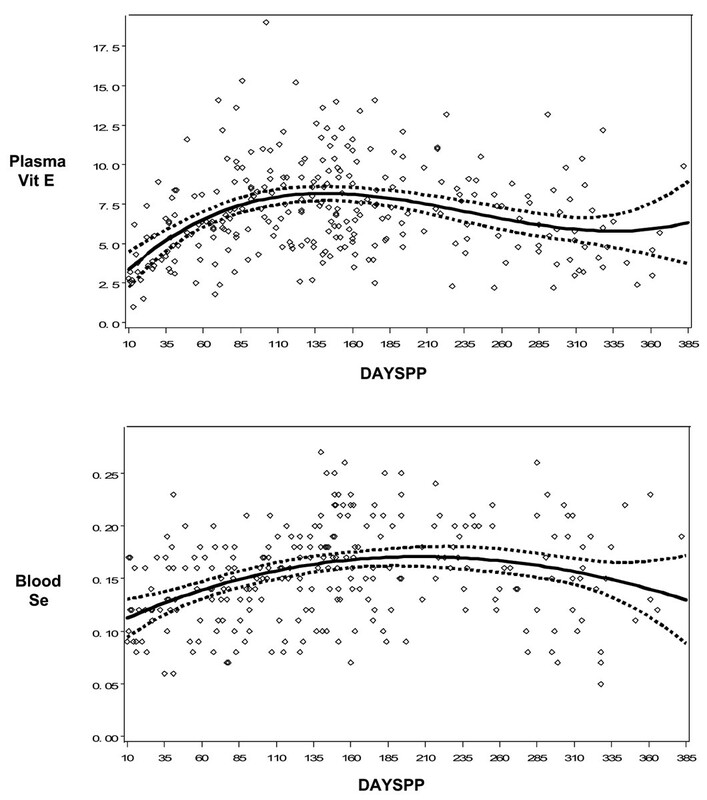 For blood Se, the strongest contributing parameter in the GLM model was also DAYSPP, and the relation between DAYSPP and blood Se was quite similar to the one found between DAYSPP and plasma vit E (Fig. 2). An increase in plasma Se in the first months after calving has been observed by other authors [43, 25]. supposed this effect to be directly related to supplied Se in the feed. This study supports that explanation by finding that the two other individual factors contributing significantly to the blood Se variation were the amount of concentrates (CONC) and the amount of mineral supplement (MIN) fed at the time of sampling. The results indicate that the nutritional supply of Se might be less than adequate in heifers and non-lactating cows in Norway. In a subsequent study,  have confirmed this assumption. The importance of concentrates and mineral supplements for the blood Se concentrations is in good accordance with the estimated Se content of different feedstuffs used in dairy cattle in Norway in 1992. Se concentrations in forage grown in Norway are generally low, with averages varying from 0.01 to 0.03 mg/kg dry matter in different regions . On the other hand, the concentrates used for lactating dairy cattle in Norway are generally commercial compound concentrates, and in 1992 these had a standardised Se addition of 0.20 mg/kg [49, 27]. Likewise, the main mineral supplements sold in Norway had a standardised Se content of 20 mg/kg . A calculation based on these values shows that in the average amount of feedstuffs given to the cows at sampling time, the concentrates provided about 70% of the Se intake, mineral supplements about 20%, and the roughages 10% or less. found a seasonal variation in plasma Se, with the highest values recorded in the months January–June, and also ascribed this to the effect of winter feeding with Se-enriched compound concentrates. The results of the statistical analysis of herd factors contributing to the variation in plasma vit E and blood Se in the sampled cows must be interpreted with caution, as only one cow from each herd was sampled. As expected, the statistical contributions of the herd factors, as reflected in the calculated R2 values, were also smaller than the calculated contribution from the individual parameters. Still, the findings that the size of the herd contributed to the vit E variation, and that the average milk yield contributed to the variation of both parameters are interesting. It is also worth noting that at herd level, the percentages of silage and concentrates in the feeding of the herd were both correlated to plasma vit E as well as to blood Se. These findings suggest a better vit E and Se status in the larger dairy herds with intensive feeding and high milk yield. The observed correlation between plasma vit E and blood Se in individual cows in this study may have several explanations. The parallel variation of the two nutrients with DAYSPP may contribute to this correlation, as may the herd effect discussed above. A direct influence of one of the nutrients on the level of the other is less likely . In the present study, no significant differences in plasma vit E or blood Se were found between cows with recorded treatments for any mastitis, acute mastitis, parturient paresis or reproductive disorders during the relevant lactation period and those without such treatments (Table 3). The risk of nutritional muscle dystrophy and other specific clinical signs in cattle deficient in vit E and Se is well documented . These problems are generally associated with blood Se levels below 0.03 μg/ml [20, 47]. Conclusions in the literature are less consistent regarding the significance of vit E and Se status for the occurrence of mastitis and reproductive disorders. Experimentally, several studies have shown positive effects of vit E and/or Se supplementation on the frequency or duration of mastitis [35, 9, 23, 44], while other studies have failed to confirm such effects [11, 4]. In epidemiological studies, an association between low Se status and udder health problems has been observed by some authors [10, 43, 6], and between mastitis and low plasma vit E by . Other authors have not confirmed any connection between mastitis frequency and Se [31, 26] or vit E status . There seem to be some differences in conclusions between scientists in the USA and in Europe, especially concerning vit E. In a review article,  concluded that further research on the effect of vitamin E supplementation on mastitis in Europe was urgently required. Some of the discrepancies between different epidemiological studies may be explained by differences in background levels of the two nutrients. The studies showing associations between levels of Se and mastitis generally have very low plasma or blood Se levels in the high mastitis or high somatic cell count groups , or a plasma vit E level below 3 μg/ml in the whole study population . On the other hand,  found a mean plasma vit E level above 7 μg/ml in their population, and no herds with an average level below 5 μg/ml. Differences in results may also be related to the epidemiological methods used. The lack of association between recorded clinical mastitis and vit E or Se levels observed in the present study does not refute the results of other authors. It does indicate that under Norwegian conditions and with the feeding and mineral supplies in regular use at the time of this study, the benefit of additional treatment with vit E and/or Se in the active lactation period might be small. However, in a subsequent study  found some evidence for an association between low blood Se levels in heifers and non-lactating cows and the risk of mastitis during the first 30 days of lactation in the same herds. Several authors have reported positive effects of vit E supplementation on the frequency of retained placenta [21, 8]. In this study, the number of sampled cows with retained placenta after the last calving was too small for a meaningful statistical analysis. The lack of an observed association between blood Se level and reproduction disorders in general is in line with the results of . In the present study, blood Se was significantly lower in cows with recorded treatments for ketosis in the same lactation than in those without (Table 3). This result must be interpreted with caution. Ketosis is a disease strongly related to variations in feeding, and its frequency may vary with the amount of concentrates in the feed . As mentioned above, the amount of concentrates fed to the cows was found to be a significant contributing factor to the blood Se level. In this study, the number of unwanted milk flavour reports for the sampled herds was too small to draw meaningful conclusions. This indicates that representative surveys of the dairy cow population are not well suited for studying milk flavour problems in Norway. Other epidemiological methods should be applied. Winter-fed lactating Norwegian dairy cows were found to have an adequate plasma level of vit E and a marginal-to-adequate level of blood Se. Silage seemed to be the most important source of Vit E, and Se-supplemented commercial concentrates the most important Se source. No significant differences in vit E or Se status could be found between cows with or without recorded treatments of mastitis, parturient paresis or reproductive disorders. 1For practical reasons, the National Veterinary Institute calculates blood Se concentrations in μg/g. 1 μg/g corresponds to 1.052 μg/ml . Reprints may be obtained from: T. Sivertsen, Norwegian School of Veterinary Science, P.O. Box 8146 Dep., N-0033 Oslo, Norway. We thank the 182 participating veterinary practitioners throughout Norway for taking the blood samples and filling in the questionnaires. We also thank the laboratory staff in the Department of chemistry at the National Veterinary Institute for performing the Se analyses, and professor Stig Larsen for assistance in the planning of the project.